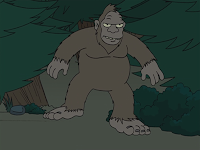 B is for Bigfoot, an ape-like creature that some people believe inhabits forests in the Pacific Northwest region of North America. Bigfoot has been a huge part of US popular culture for decades. 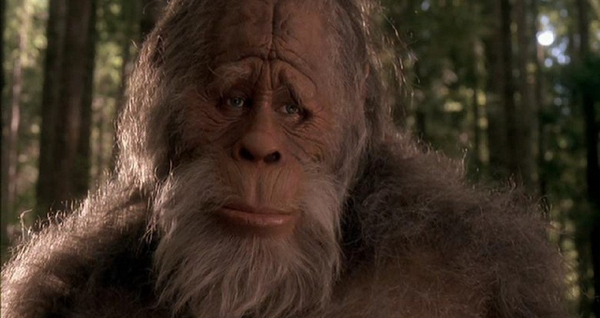 Here are five of Bigfoot's biggest appearances in movies and TV. NOTE: After extensive research, it seems there's a debate about the plural of bigfoot, but most agree that the plural of bigfoot is bigfoot, so that's what I used in the title. 5. Harry and the Hendersons - In the 1987 comedy, a suburban family hits Bigfoot (Kevin Peter Hall) with their car and take him home to live with them. The movie won an Academy Award for Best Makeup, and led to a TV series. Harry is one of the few movies that portrays Bigfoot as a loveable creature instead of one to be feared. 4. Monsters, Inc - In the animated comedy about a world of monsters, they encounter a Yeti (a.k.a. 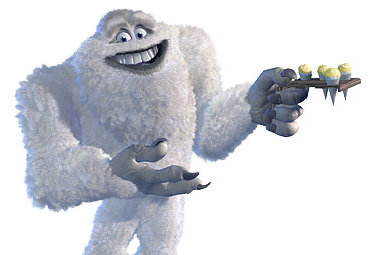 the Abominable Snowman) who once worked at Monsters, Inc. until being banished to the Himalayas. Another loveable Bigfoot, he also has the benefit of making great sno-cones. 3. The Six Million Dollar Man - In the TV series about the Bionic Man, Steve Austin discovers that Bigfoot is really an android created by aliens to protect their hidden lair. While fans of the show are divided as to whether fighting Bigfoot made Six Million Dollar Man better or worse, there's no denying he was a popular character. He was brought back in a later show, and even spun off into his own TV show. 2. Futurama - In the episode "Spanish Fry," Fry goes into the wilderness to go camping and look for Bigfoot. Along the way, Fry gets his nose stolen by aliens, but ends up being saved by Bigfoot. It's good to know that Bigfoot still exists in the year 3000. 1. The Patterson-Gimlin Film - By far the most influential Bigfoot in pop culture, this famous short film is either the only known authentic footage of Bigfoot or one of the greatest hoaxes in history. 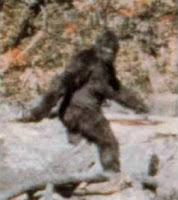 Either way, it's single-handedly defined the look and gait of Bigfoot in pop culture. Which is your favorite Bigfoot? We're highlighting 26 great geek blogs this month. Today's blog is Born For Geekdom, run by Audrey Brown (a self-described fangirl) who likes to rant and/or rave on various subjects. Audrey is a long-time magazine writer and video producer who recently sold her first two screenplays. She also does a podcast. Check it out. Wow, I remember watching those Six Million Dollar Man episodes when I was a kid! He was from space. Guess I have to give it up for the space Bigfoot. loved six million dollar man's big foot... really as a kid, it scared me. why don't I remember that episode of the Bionic Man? They should redo the bionic people. They had a bigfoot hunt right before we moved here. I'm really sorry I missed out on that fun. I forgot about Harry and the Henderson. He was a great bigfoot. Interesting list! I've never watched anything with Bigfoot, though I've heard of/seen excerpts from the short film. 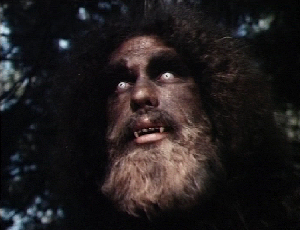 Andre the Giant played Bigfoot in Six Million Dollar Man. That show had me hooked when it was on tv and even today, the sound effects and intro rock. The Bumble from Rudolph the Red-nosed Reindeer. He bounces! I'd vote for Chewbacca. He's close enough to a Bigfoot. Hi Maurice. Thanks for your comment on my blog. Your blog is awesome. I wish I knew how to customize a similar template. My favorite is Harry. You can't go wrong w/ lovable Harry. Didn't Peter Hall also play the Predator? I have another suggestion for Bigfoot. Did you ever see that movie 'Abominable?' it was pretty low budget. What could the plural word for Bigfoot be? Bigfoots? Bigfeet? Bigfeets? I guess Bigfoot is the logical choice for plural, though I was under the understanding he was a loner, which would pretty much eliminate the need for the term to begin with. My favorite is Harry from Harry and the Hendersons. Great movie. Yup, Kevin Peter Hall played the Predator and Harry.